The remnants of a once-famous quartet now live in a retirement complex. 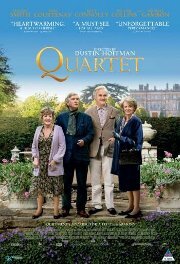 One day they get a new resident, who turns out to be the fourth member of their quartet, who split the group, and her husband, as her ego and fame group. Now that they're back in the same residence, and with an upcoming annual performance to rehearse for, will they be able to patch up their differences in time? We'll just ignore the babe.